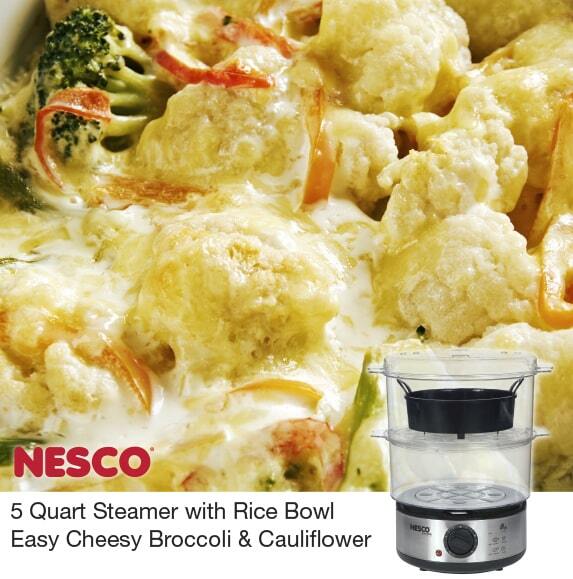 The NESCO® 5 Quart Steamer with Rice Bowl makes this Cheesy Broccoli & Cauliflower recipe simple and tasty. The rice bowl is used here to make the creamy cheese sauce that is oh so delicious. The sauce is made right inside the steamer along with your perfectly cooked vegetables. Try it and let us know what you think. Also, let us know what are some of your favorite foods you like to make in your NESCO Steamer. Place 1 cup water in water reservoir (base of unit) of Nesco Electric Food Steamer. Place broccoli, butter and cauliflower in lower Steamer basket. Cover and steam for 20-25 minutes. Mix together cheese spread, white sauce and pepper and pour into rice bowl. Place in upper Steamer basket approximately 10 minutes before end of steam cycle to soften. To serve, pour cheese sauce over vegetables.